Unisource re-launches its website to enhance the client experience by optimizing data processing, providing even more detailed information, processing credit card payments and allowing for comprehensive order tracking. Unisource is Canada’s largest single-source distributor of nearly 90,000 printing, graphic arts, packaging, facility supply, and food & dairy products with annual sales exceeding $1 billion. The second iteration of Unisource’s e-commerce website had facilitated self-service, accuracy, efficiency and rich information at the heart of the branding strategy. This strategy was based on the objective of optimizing operations by moving new and existing clients to online order processing and delivering a superior user experience. In order to reach the objective and create advantages to leverage, key web strategies were defined based on careful analysis and deliberation. Essential to the project was the provision of current and comprehensive order status, order history, product detail, real-time inventory, pricing and account statement information along with optimized data processing, and safe alternative payment options. File processing optimizations were implemented through incrementally-applied changes to the product database. User interface updates now accommodate higher screen resolutions and the use of AJAX. Product search functionality was enhanced by improved access to products within Unisource’s catalogue. Product details, keywords, images and drilldowns were all enhanced to be more readily accessible to Unisource clients. Orders can be tracked in real-time and proof of delivery can be reported by displaying delivery receipt signatures. Future price changes can be announced—allowing customers to view forecasted pricing and the dates on which they come into effect such that clients can take advantage of future price breaks and plan their purchasing accordingly. Granular account statement information can be provided to management-level users. 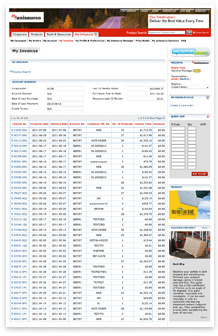 Real-time inventory information is now provided; limited stock availability is indicated along with product alternatives. Customer support can be provided to change order and delivery arrangements. Payment processing by credit card was added. Tax considerations were addressed by the implementation of a new sub-module accessible to Unisource administrators. Password strength requirements were imposed on clients and all login information passes through an encrypted connection. In summary, the client experience was enhanced by several significant optimizations to the My Unisource application. The richness of detailed and current information available to the client is unparalleled. Transactional capabilities and the security with which everything is processed allow clients a much-improved, facilitated method by which to order, track and account for their inventories. The customizations made in this implementation of updates to Unisource’s IgnitionWeb installation included: a real-time inventory implementation, a proof of delivery system, enabled credit card processing and live chat customer support. Prior to 2008, Unisource received orders primarily through a dedicated sales support and electronic data interchange technology integrated with the company’s enterprise resource planning system. A significant amount of human intervention in order processing and communications, and the costs associated with them were significant. Unisource reached its goal of transitioning 30% of its business to transacting online. The updates successfully helped Unisource to drive down the cost of operations, drive revenue through their online channel and open the door for further client acquisition. As this proportion of orders going through the Unisource website continues to grow, the company can expect more improvement in operational efficiency while serving a growing client base and capturing additional market share.